Quite clearly I didn’t manage to keep up with my intention to publish my week notes regularly. As things became a little crazy before Christmas, these always ended up at the bottom of my prioritised list. I’m going to give them another go, but they’ll probably be shorter, but hopefully still interesting. Vehicle tax & SORN – in my last set of notes I mentioned that we’d set up a team to look at making the tax disc buying process easier. This team has been working away since then to build a service we can release into public beta. A few weeks ago we passed our Digital by Default Service Standard Assessment (read the report), so hopefully we’ll be ready to show it off to the public soon. View driving record – there’s been quite a bit of activity happening on this project recently. This has also undergone (and passed) it’s DbD assessment (report will hopefully be published soon). Work is focussing on automating the infrastructure, performance testing and preparing for access to the underlying driving record data. 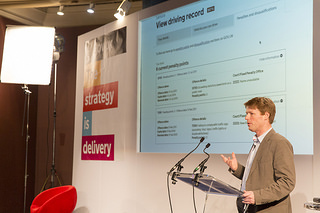 There’s also been a fair amount of comms about it and Oliver (DVLA CEO) demoed it at the recent #Sprint14 event. Vehicle management & personalised registrations – when I last wrote about this, we were just picking the supplier. Since then, we’ve brought in an SME to work with us on the service, completed an inception and finished the first 2 sprints of our Alpha. For the next few weeks we’ll be focussing on building things we can test with users, and prototyping how we can push data back into DVLA’s estate. Other things – I’ve recently visited the new TechHub in Swansea, got to go to Sprint14 to see ministers and senior civil servants show off things we’ve been building, been an assessor for two DbD assessments and had several weeks of much-needed time off.